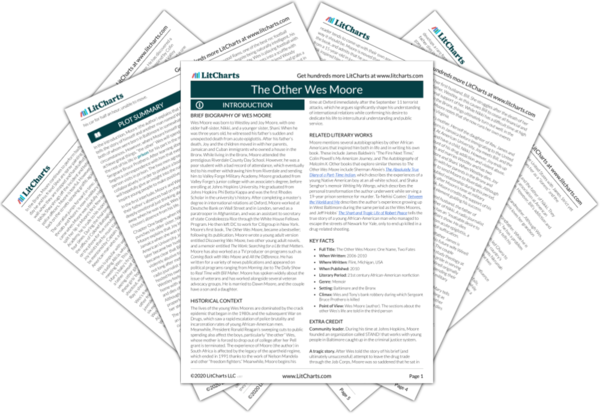 Instant downloads of all 946 LitChart PDFs (including The Other Wes Moore). 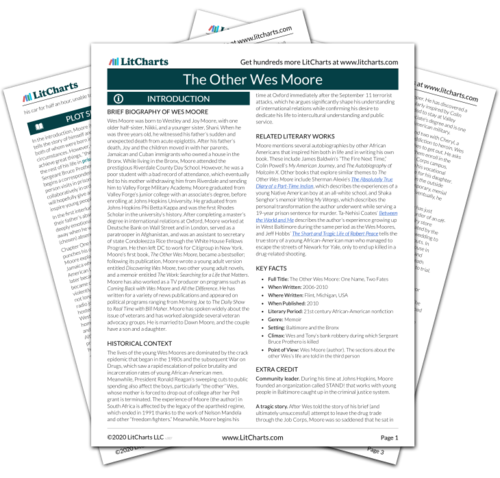 Welcome to the LitCharts study guide on Wes Moore's The Other Wes Moore. Created by the original team behind SparkNotes, LitCharts are the world's best literature guides. A concise biography of Wes Moore plus historical and literary context for The Other Wes Moore. A quick-reference summary: The Other Wes Moore on a single page. In-depth summary and analysis of every Chapter of The Other Wes Moore. Visual theme-tracking, too. Explanations, analysis, and visualizations of The Other Wes Moore's themes. The Other Wes Moore's important quotes, sortable by theme, character, or Chapter. Description, analysis, and timelines for The Other Wes Moore's characters. Explanations of The Other Wes Moore's symbols, and tracking of where they appear. An interactive data visualization of The Other Wes Moore's plot and themes. Wes Moore was born to Westley and Joy Moore, with one older half-sister, Nikki, and a younger sister, Shani. When he was three years old, he witnessed his father’s sudden and unexpected death from acute epiglottis. After his father’s death, Joy and the children moved in with her parents, Jamaican and Cuban immigrants who owned a house in the Bronx. While living in the Bronx, Moore attended the prestigious Riverdale County Day School. However, he was a poor student with a bad record of attendance, which eventually led to his mother withdrawing him from Riverdale and sending him to Valley Forge Military Academy. Moore graduated from Valley Forge’s junior college with an associate’s degree, before enrolling at Johns Hopkins University. He graduated from Johns Hopkins Phi Betta Kappa and was the first Rhodes Scholar in the university’s history. After completing a master’s degree in international relations at Oxford, Moore worked at Deutsche Bank on Wall Street and in London, served as a paratrooper in Afghanistan, and was an assistant to secretary of state Condoleezza Rice through the White House Fellows Program. He then left DC to work for Citigroup in New York. Moore’s first book, The Other Wes Moore, became a bestseller; following its publication, Moore wrote a young adult version entitled Discovering Wes Moore, two other young adult novels, and a memoir entitled The Work: Searching for a Life that Matters. Moore has also worked as a TV producer on programs such as Coming Back with Wes Moore and All the Difference. He has written for a variety of news publications and appeared on political programs ranging from Morning Joe to The Daily Show to Real Time with Bill Maher. Moore has spoken widely about the issue of veterans and has worked alongside several veteran advocacy groups. He is married to Dawn Moore, and the couple have a son and a daughter. 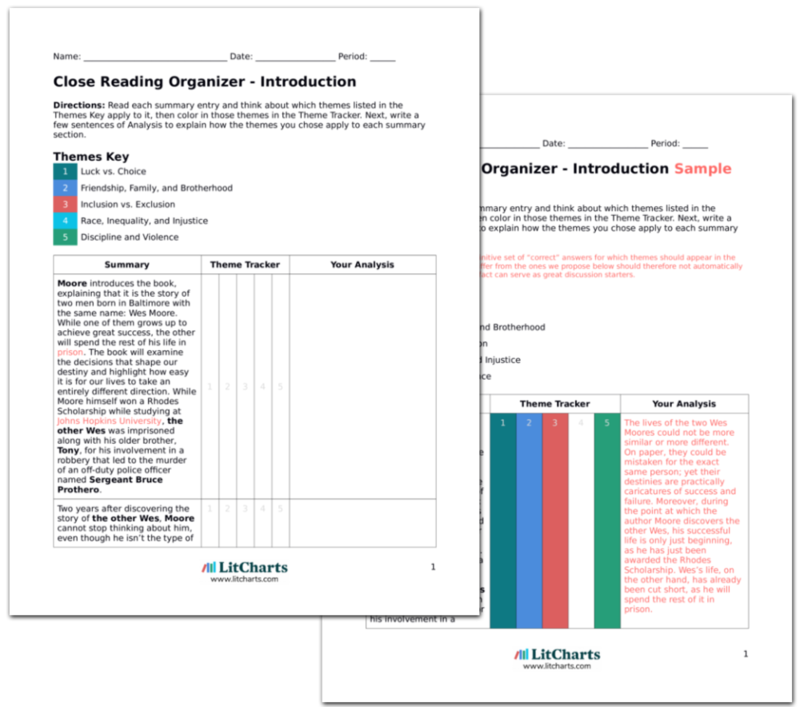 Get the entire The Other Wes Moore LitChart as a printable PDF. The lives of the young Wes Moores are dominated by the crack epidemic that began in the 1980s and the subsequent War on Drugs, which saw a rapid escalation of police brutality and incarceration rates of young African-American men. Meanwhile, President Ronald Reagan’s sweeping cuts to public spending also affect the boys, particularly “the other” Wes, whose mother is forced to drop out of college after her Pell grant is terminated. The experience of Moore (the author) in South Africa is affected by the legacy of the apartheid regime, which ended in 1991 thanks to the work of Nelson Mandela and other “freedom fighters.” Meanwhile, Moore begins his time at Oxford immediately after the September 11 terrorist attacks, which he argues significantly shape his understanding of international relations while confirming his desire to dedicate his life to intercultural understanding and public service. Moore mentions several autobiographies by other African Americans that inspired him both in life and in writing his own book. These include James Baldwin’s “The Fire Next Time,” Colin Powell’s My American Journey, and The Autobiography of Malcolm X. Other books that explore similar themes to The Other Wes Moore include Sherman Alexie’s The Absolutely True Diary of a Part-Time Indian, which describes the experiences of a young Native American boy at an all-white school, and Shaka Senghor’s memoir Writing My Wrongs, which describes the personal transformation the author underwent while serving a 19-year prison sentence for murder. Ta-Nehisi Coates’ Between the World and Me describes the author’s experience growing up in West Baltimore during the same period as the Wes Moores, and Jeff Hobbs’ The Short and Tragic Life of Robert Peace tells the true story of a young African-American man who managed to escape the streets of Newark for Yale, only to end up killed in a drug-related shooting. Community leader. During his time at Johns Hopkins, Moore founded an organization called STAND! that works with young people in Baltimore caught up in the criminal justice system. A tragic story. After Wes told the story of his brief (and ultimately unsuccessful) attempt to leave the drug trade through the Job Corps, Moore was so saddened that he sat in his car for half an hour, unable to move. Seresin, Indiana. "The Other Wes Moore." LitCharts. LitCharts LLC, 7 Feb 2017. Web. 23 Apr 2019. Seresin, Indiana. "The Other Wes Moore." LitCharts LLC, February 7, 2017. Retrieved April 23, 2019. https://www.litcharts.com/lit/the-other-wes-moore.